3 Bimetal bearings have a steel back, which supports the bearing structure. The back provides bearing rigidity and its press fit under severe conditions of increased temperature and cycling loads. The second layer is the bearing lining. It is relatively thick. Its thickness is about 0.012". Large thickness of the lining is important feature of bi-metal bearings. It allows accommodation of great misalignments and other geometry irregularities. It also provides embedability for both large and small foreign particles. Commonly, the lining is made of an aluminum alloy containing 6-20% of tin. Tin serves as a solid lubricant and provides anti-friction properties (compatibility, conformability, embedability). Another additive is 2-4% of silicon dispersed in aluminum in form of fine particles. Hard silicon strengthens the alloy and also serves as an abrasive polishing the journal surface. Presence of silicon is particularly important for engines with cast iron crankshafts. The alloy may be additionally strengthened by copper, nickel and other elements. The two main layers (steel and lining) are bonded to each other by means of a bonding layer of pure aluminum. 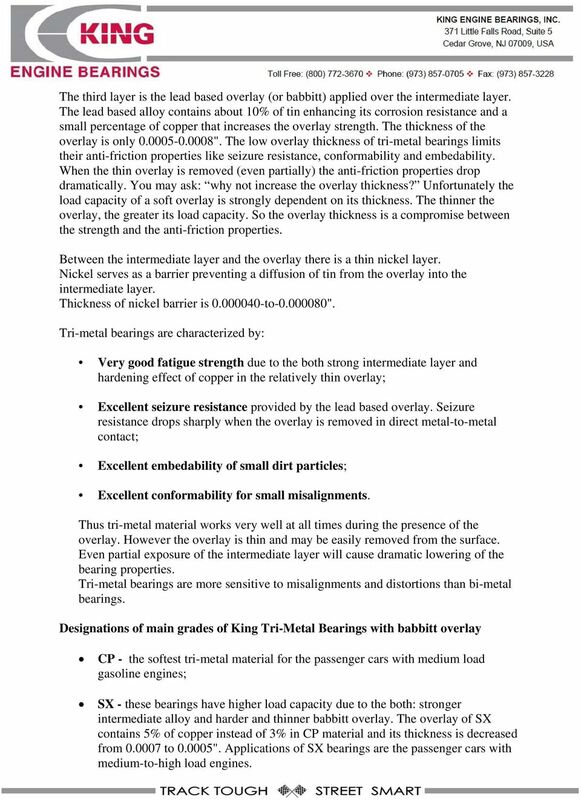 King bi-metal materials have a homogeneous micro-structure, which guarantees the combination of the following bearing properties: Good fatigue strength due to the both fine micro-structure and hardening effect of silicon and copper; Very seizure resistance particularly with cast iron crankshafts. This is provided by silicon particles. They continuously polish the crankshaft surface and prevent seizure. Good embedability. The lining is thick so it is capable to absorb both small and large dirt particles circulating with the oil; Good conformability. In contrast to tri-metal bearings with thin overlays, bimetal materials are capable of accommodating greater misalignments; Good wear resistance due to the relatively hard aluminum alloy, which is harder than the soft overlays of tri-metal bearings. Bi-metal Al-Si bearings bring more "added value" to rebuilt engines, due to their superior handling of adverse conditions such as misalignments, oil starvation, rough journal surface and heat. 4 Types of King Bi-metal Bearings The main grades of the King bi-metal bearings and their designations: AM this is the softest bi-metal material. It contains 20% of tin, 1% of copper and no silicon. AM bearings are used in the passenger cars with low and medium load gasoline engines. SI - is silicon containing material for the medium load gasoline engines, particularly engines using nodular cast iron crankshafts; HP - is silicon containing material for medium load high performance engines with nodular cast iron cranks and also for high load short duration engines. 2. 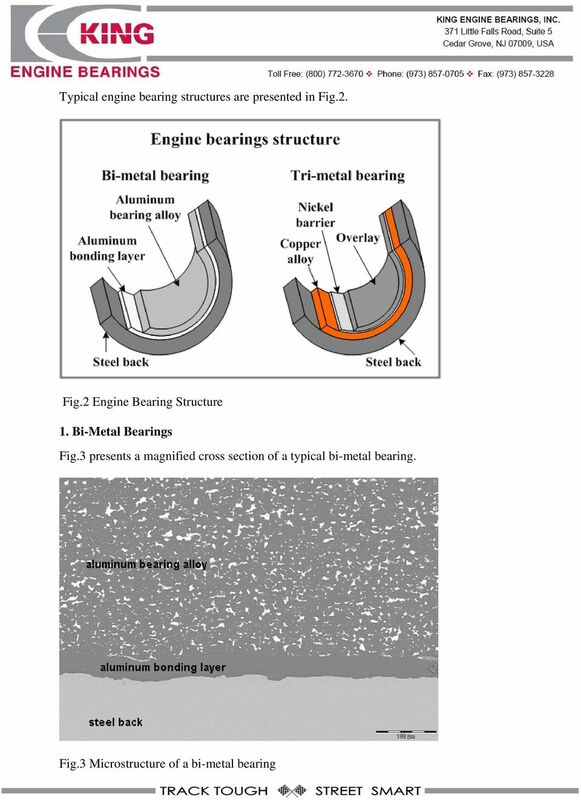 Tri-Metal Bearings with babbitt overlay Fig.4 presents a magnified cross section of a typical tri-metal bearing. Nickel barrier Babbitt overlay ( ) Copper-lead-tin alloy thick Steel back Fig.4 Microstructure of a tri-metal bearing In addition to the supporting steel back, tri-metal bearings have an intermediate layer made of a copper alloy containing 20-25% of lead as a solid lubricant and 2-5% of tin as a strengthening additive. 5 The third layer is the lead based overlay (or babbitt) applied over the intermediate layer. The lead based alloy contains about 10% of tin enhancing its corrosion resistance and a small percentage of copper that increases the overlay strength. The thickness of the overlay is only ". The low overlay thickness of tri-metal bearings limits their anti-friction properties like seizure resistance, conformability and embedability. When the thin overlay is removed (even partially) the anti-friction properties drop dramatically. You may ask: why not increase the overlay thickness? Unfortunately the load capacity of a soft overlay is strongly dependent on its thickness. The thinner the overlay, the greater its load capacity. So the overlay thickness is a compromise between the strength and the anti-friction properties. Between the intermediate layer and the overlay there is a thin nickel layer. Nickel serves as a barrier preventing a diffusion of tin from the overlay into the intermediate layer. Thickness of nickel barrier is to ". Tri-metal bearings are characterized by: Very fatigue strength due to the both strong intermediate layer and hardening effect of copper in the relatively thin overlay; Excellent seizure resistance provided by the lead based overlay. Seizure resistance drops sharply when the overlay is removed in direct metal-to-metal contact; Excellent embedability of small dirt particles; Excellent conformability for small misalignments. Thus tri-metal material works well at all times during the presence of the overlay. However the overlay is thin and may be easily removed from the surface. Even partial exposure of the intermediate layer will cause dramatic lowering of the bearing properties. Tri-metal bearings are more sensitive to misalignments and distortions than bi-metal bearings. 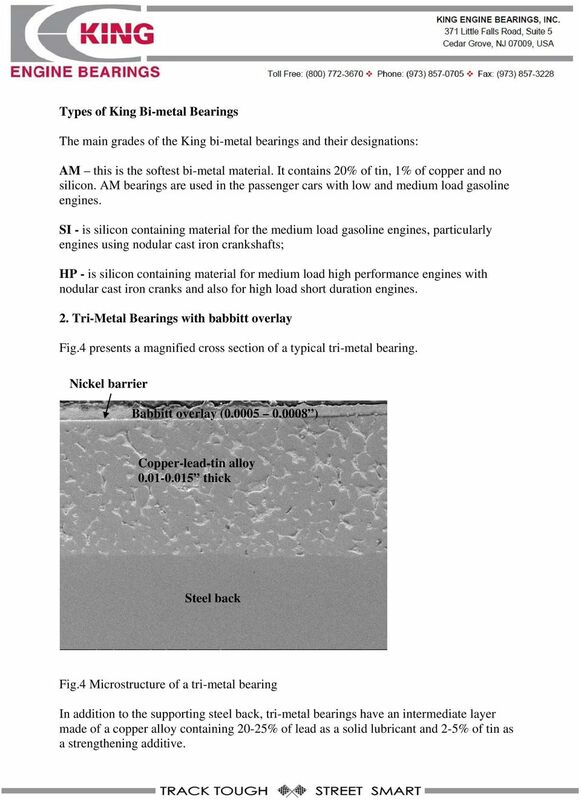 Designations of main grades of King Tri-Metal Bearings with babbitt overlay CP - the softest tri-metal material for the passenger cars with medium load gasoline engines; SX - these bearings have higher load capacity due to the both: stronger intermediate alloy and harder and thinner babbitt overlay. 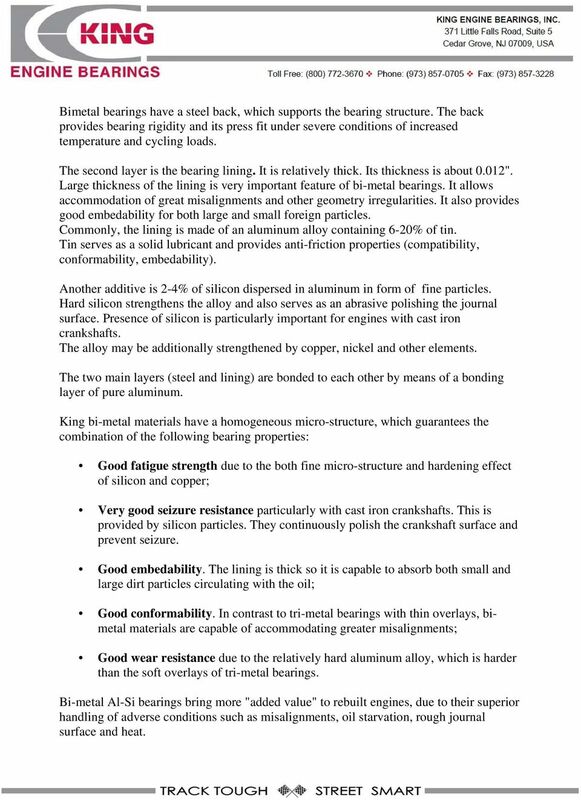 The overlay of SX contains 5% of copper instead of 3% in CP material and its thickness is decreased from to ". Applications of SX bearings are the passenger cars with medium-to-high load engines. 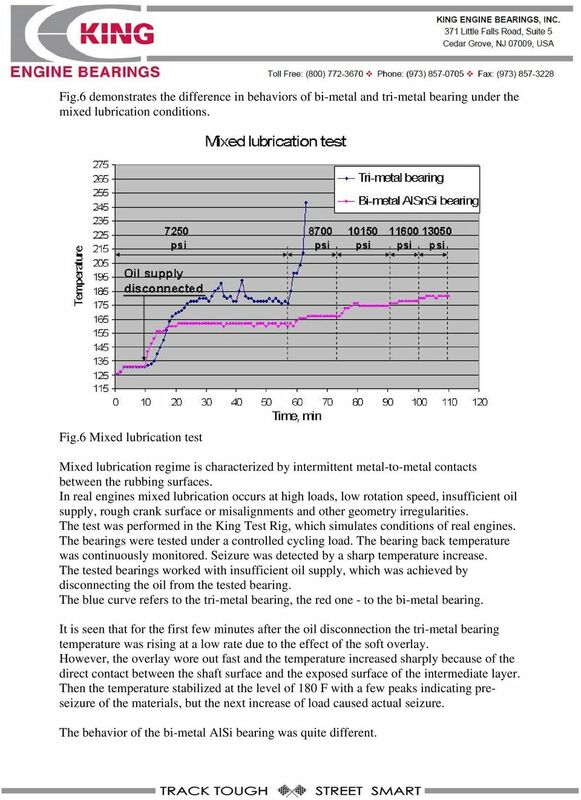 7 Fig.6 demonstrates the difference in behaviors of bi-metal and tri-metal bearing under the mixed lubrication conditions. Fig.6 Mixed lubrication test Mixed lubrication regime is characterized by intermittent metal-to-metal contacts between the rubbing surfaces. In real engines mixed lubrication occurs at high loads, low rotation speed, insufficient oil supply, rough crank surface or misalignments and other geometry irregularities. The test was performed in the King Test Rig, which simulates conditions of real engines. The bearings were tested under a controlled cycling load. The bearing back temperature was continuously monitored. Seizure was detected by a sharp temperature increase. The tested bearings worked with insufficient oil supply, which was achieved by disconnecting the oil from the tested bearing. The blue curve refers to the tri-metal bearing, the red one - to the bi-metal bearing. It is seen that for the first few minutes after the oil disconnection the tri-metal bearing temperature was rising at a low rate due to the effect of the soft overlay. However, the overlay wore out fast and the temperature increased sharply because of the direct contact between the shaft surface and the exposed surface of the intermediate layer. Then the temperature stabilized at the level of 180 F with a few peaks indicating preseizure of the materials, but the next increase of load caused actual seizure. The behavior of the bi-metal AlSi bearing was quite different. 8 At the initial load the bearing temperature stabilized at 160 F and after each load increase, the temperature rose by only 5-10 F and then stabilized. Seizure did not occur, even at the high load of psi. The test has demonstrated that bi-metal bearings offer more protection compared to trimetal bearings under mixed lubrication conditions. 4. King high strength tri-metal material: GP (Gold Performance) King Engine Bearings has developed a high strength tri-metal material. The bearing, which we call GP (Gold Performance) has tri-metal structure with a proprietary overlay composed of two materials (neither is lead). One of them (the base) is hard but has a seizure resistance. The second component is a solid lubricant. The intermediate layer of GP bearings may be made of either leaded or lead free copper alloy. Excellent adherence of the overlay to the intermediate layer is provided by a proprietary bonding layer. GP bearing characterization GP bearing has an extremely high load capacity (twice as high as conventional trimetal bearing). GP material has anti-friction properties due to the combined action of the proprietary overlay components. 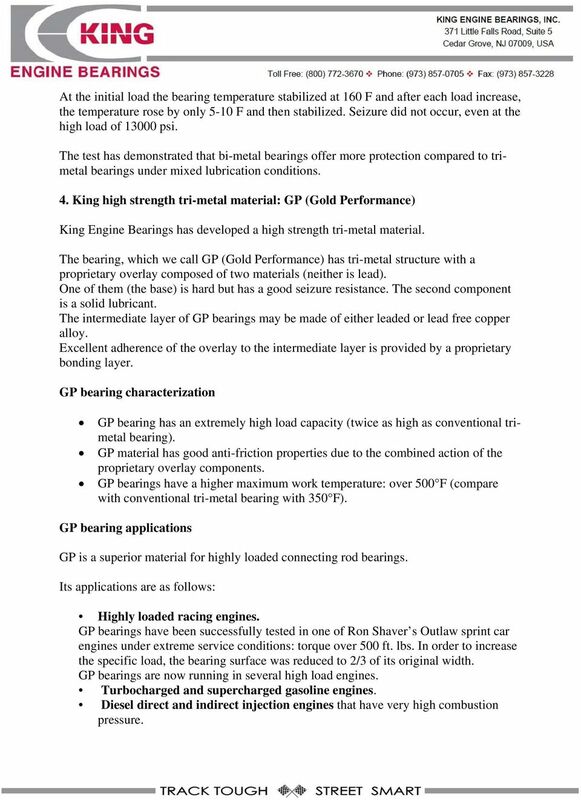 GP bearings have a higher maximum work temperature: over 500 F (compare with conventional tri-metal bearing with 350 F). 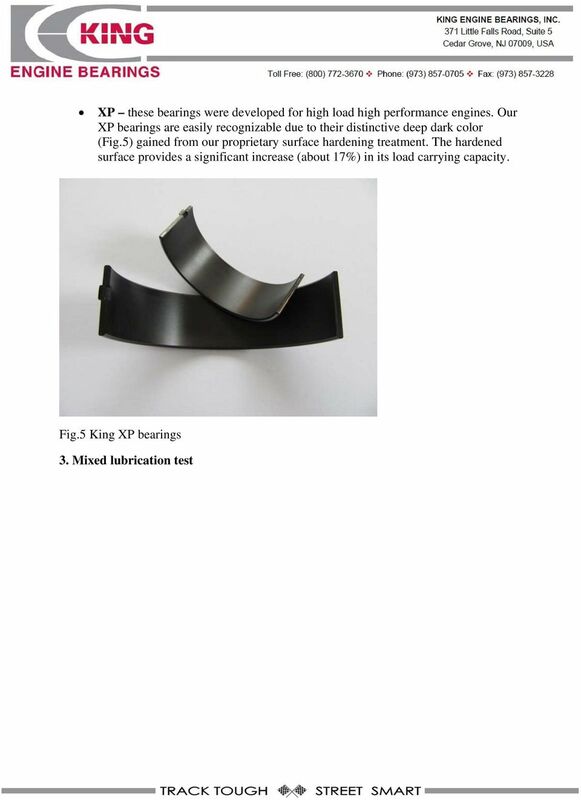 GP bearing applications GP is a superior material for highly loaded connecting rod bearings. Its applications are as follows: Highly loaded racing engines. GP bearings have been successfully tested in one of Ron Shaver s Outlaw sprint car engines under extreme service conditions: torque over 500 ft. lbs. In order to increase the specific load, the bearing surface was reduced to 2/3 of its original width. GP bearings are now running in several high load engines. Turbocharged and supercharged gasoline engines. Diesel direct and indirect injection engines that have high combustion pressure. 9 5. 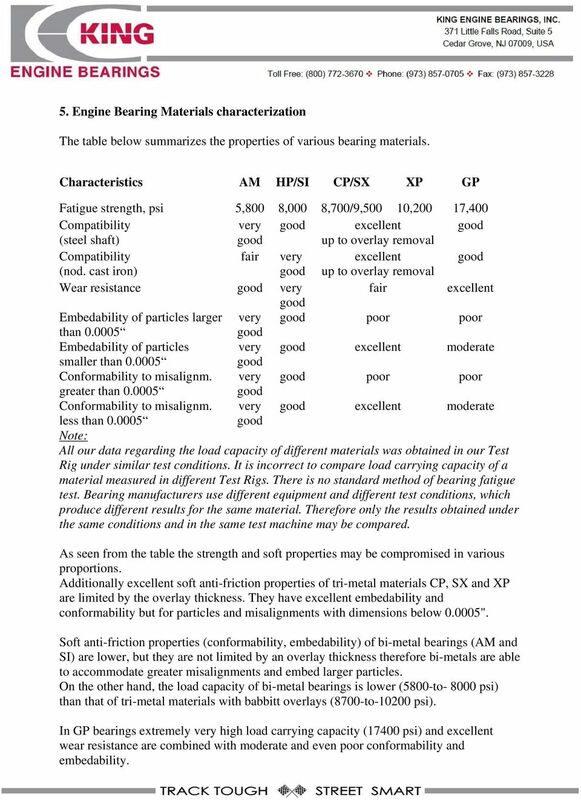 Engine Bearing Materials characterization The table below summarizes the properties of various bearing materials. Characteristics AM HP/SI CP/SX XP GP Fatigue strength, psi Compatibility (steel shaft) Compatibility (nod. cast iron) Wear resistance Embedability of particles larger than Embedability of particles smaller than Conformability to misalignm. greater than Conformability to misalignm. less than Note: 5,800 fair 8,000 8,700/9,500 10,200 excellent up to overlay removal excellent up to overlay removal fair poor excellent poor excellent 17,400 excellent poor moderate poor moderate All our data regarding the load capacity of different materials was obtained in our Test Rig under similar test conditions. It is incorrect to compare load carrying capacity of a material measured in different Test Rigs. There is no standard method of bearing fatigue test. Bearing manufacturers use different equipment and different test conditions, which produce different results for the same material. Therefore only the results obtained under the same conditions and in the same test machine may be compared. As seen from the table the strength and soft properties may be compromised in various proportions. Additionally excellent soft anti-friction properties of tri-metal materials CP, SX and XP are limited by the overlay thickness. They have excellent embedability and conformability but for particles and misalignments with dimensions below ". Soft anti-friction properties (conformability, embedability) of bi-metal bearings (AM and SI) are lower, but they are not limited by an overlay thickness therefore bi-metals are able to accommodate greater misalignments and embed larger particles. On the other hand, the load capacity of bi-metal bearings is lower (5800-to psi) than that of tri-metal materials with babbitt overlays (8700-to psi). In GP bearings extremely high load carrying capacity (17400 psi) and excellent wear resistance are combined with moderate and even poor conformability and embedability. 10 6. 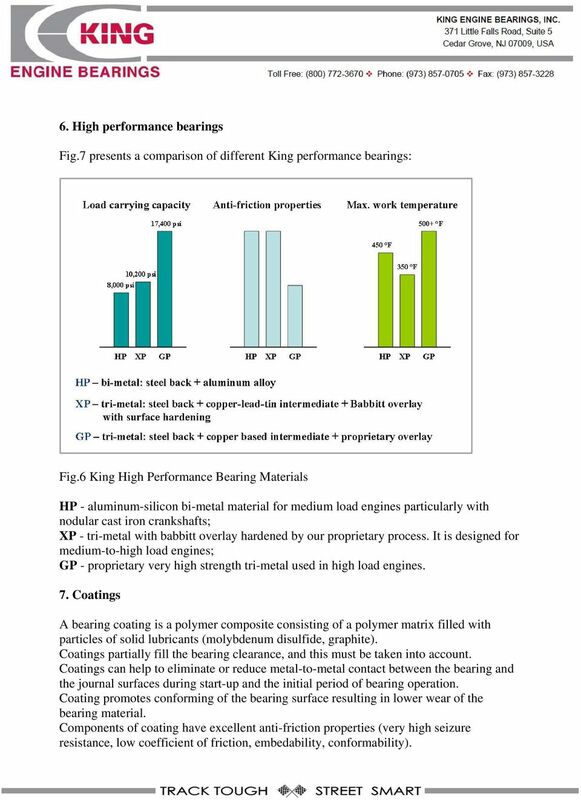 High performance bearings Fig.7 presents a comparison of different King performance bearings: Fig.6 King High Performance Bearing Materials HP - aluminum-silicon bi-metal material for medium load engines particularly with nodular cast iron crankshafts; XP - tri-metal with babbitt overlay hardened by our proprietary process. It is designed for medium-to-high load engines; GP - proprietary high strength tri-metal used in high load engines. 7. Coatings A bearing coating is a polymer composite consisting of a polymer matrix filled with particles of solid lubricants (molybdenum disulfide, graphite). Coatings partially fill the bearing clearance, and this must be taken into account. Coatings can help to eliminate or reduce metal-to-metal contact between the bearing and the journal surfaces during start-up and the initial period of bearing operation. Coating promotes conforming of the bearing surface resulting in lower wear of the bearing material. Components of coating have excellent anti-friction properties ( high seizure resistance, low coefficient of friction, embedability, conformability). 11 However, coatings are often sacrificial layers, they can wear fast under high load in mixed lubrication regime (metal-to-metal contact). When the coating is removed by friction, the bearing clearance is increased by the value of the coating thickness. Therefore coatings should not be too thick (no thicker than ). Some bearing manufacturers have developed durable coatings made of high strength polymers with additions of solid lubricants and abrasive particles. Such coatings have much better wear resistance and may even replace the metal based overlays. Wear resistant coatings are used in lead free bearings. 8. 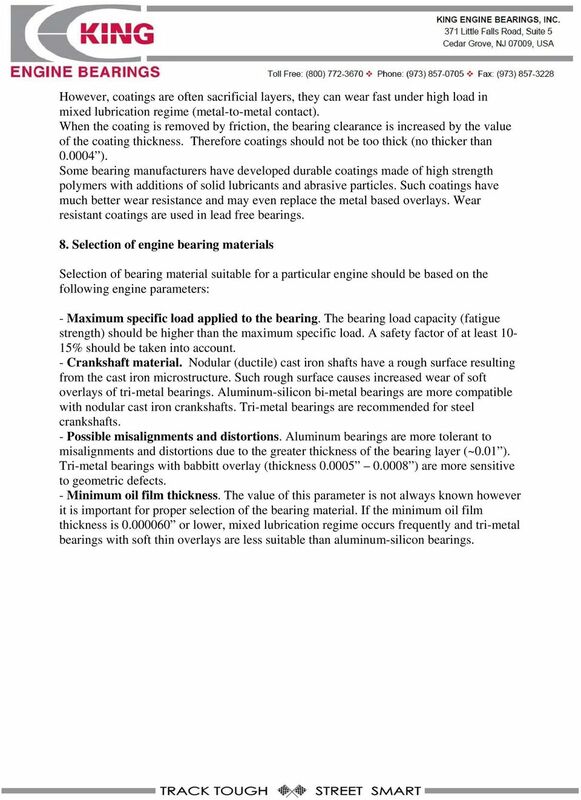 Selection of engine bearing materials Selection of bearing material suitable for a particular engine should be based on the following engine parameters: - Maximum specific load applied to the bearing. The bearing load capacity (fatigue strength) should be higher than the maximum specific load. A safety factor of at least 10-15% should be taken into account. - Crankshaft material. Nodular (ductile) cast iron shafts have a rough surface resulting from the cast iron microstructure. Such rough surface causes increased wear of soft overlays of tri-metal bearings. Aluminum-silicon bi-metal bearings are more compatible with nodular cast iron crankshafts. Tri-metal bearings are recommended for steel crankshafts. - Possible misalignments and distortions. Aluminum bearings are more tolerant to misalignments and distortions due to the greater thickness of the bearing layer (~0.01 ). Tri-metal bearings with babbitt overlay (thickness ) are more sensitive to geometric defects. - Minimum oil film thickness. The value of this parameter is not always known however it is important for proper selection of the bearing material. If the minimum oil film thickness is or lower, mixed lubrication regime occurs frequently and tri-metal bearings with soft thin overlays are less suitable than aluminum-silicon bearings. ENGINEERING MATERIALS: a. Pig Iron: -product of the blast furnace and the basis of all ferrous metals, used for the manufacture of cast iron, carbon steel and alloy steels. never used as a structural material. Ceramic processing. The higher performance of ceramics is the result of strict control ol of purity, composition, microstructure and processing. History, background. l May. Peter Robertson shipwrecked outside Gothenburg, starts a forge, later the city forge. Training Objective After watching the program and reviewing this printed material, the viewer will gain a knowledge and understanding of the basics of powder metallurgy. Types of particles are explained. About Sintered Products. Products for: - Resistance Welding Electrodes - Electrical Contact Materials. Product Definition & Uses. How many atoms are in an ammonia molecule?... (1) The diagrams show the electron arrangement in nitrogen and hydrogen. WEAR TESTING AND MEASUREMENT TECHNIQUES FOR POLYMER COMPOSITE GEARS N. A. Wright and S. N. Kukureka Wear, 250, 1567, (2001) Presented at 13 th International Wear of Materials Conference, Vancouver, 2001. Modern Lubricants for Tube Bending. Christopher Fletcher, ChE Tower Oil & Technology Co.
ASM Thermal Spray Society (TSS) Accepted Practices Committee on Metallography. Accepted Practice Molybdenum Thermal Spray Coatings. 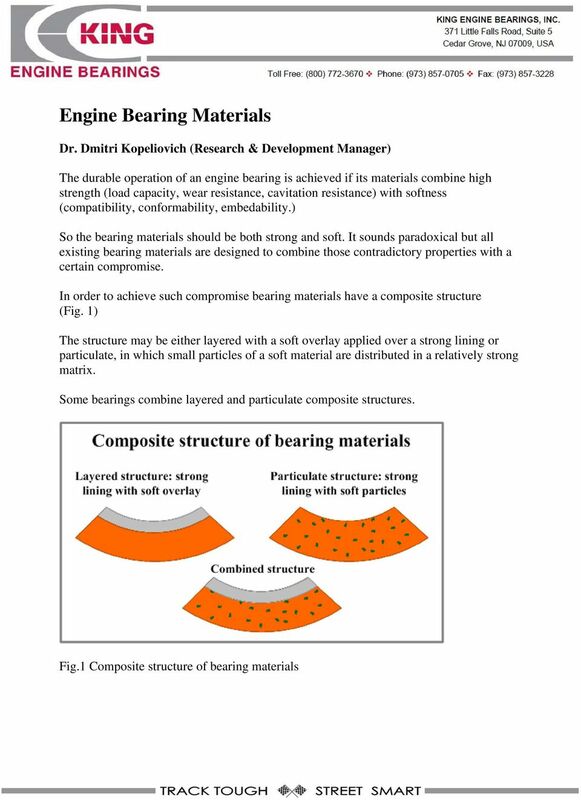 Lubrication: Why Is In Important To Lubricate Bearings? Metal Oxygen Metal Oxygen WEAR Metal HEAT OXIDATION Metal Lubrication FRICTION Five Basic Functions Of Lubrication! Reduce Friction! Reduce Wear!